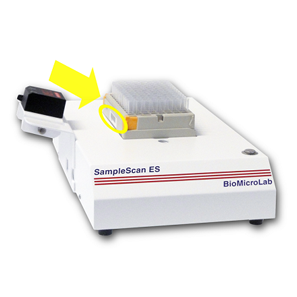 ArcticWhite offers the BioMicroLab line of SampleScan full rack and single tube barcode readers. They are easy-to-use and integrate well with other systems. All of BioMicroLab’s SampleScan 2D Barcode Readers for rack configurations can include 1D Linear Barcode Readers to scan the 1D barcode on the side of racks allowing you to quickly track the Rack ID. Supported tube rack formats include the popular 96 tube racks and also 48, 24, 12, or other capacity tube racks. 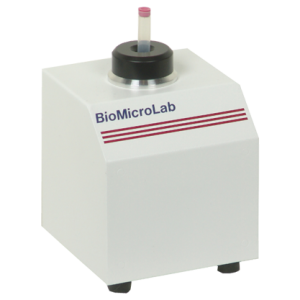 The 384 tube rack format is supported for specific 2D labware. Template scanning feature allows for use with high-density tube racks with offset rows and columns. 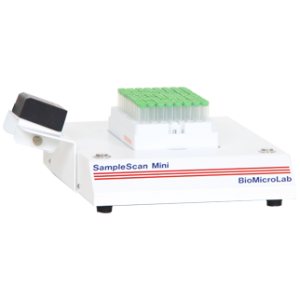 The SampleScan Mini includes BioMicroLab SampleScan 2D software. This easy to use Windows application provides point and click control of the scanner. It provides an on-screen display of the barcode image with colorful visual scan status and quick confirmation of the scanning process. Barcodes are also displayed on the screen so the user can quickly evaluate any non-readable barcodes. SDK and ActiveX Software Developer’s Toolkits are included for integration of the scanner with robotic and LIMS systems. Key features include customizable output file fields, project based workflows, and single tube scan. Quickly evaluate any non-readable barcodes by clicking on the on-screen barcodes(s) to display an expanded view of the barcode and code characteristics. 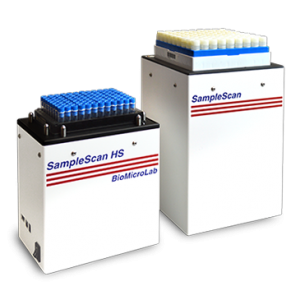 The SampleScan E-Series includes BioMicroLab SampleScan 2D software. This easy to use Windows based application provides point and click control of the scanner. It provides an on-screen display of the barcode image with colorful visual scan status for quick confirmation of the scanning process. Barcodes are also displayed on the screen so the user can quickly evaluate any non-decodable barcodes. SDK and ActiveX Software Developer’s Toolkits are included with purchase for integration of the scanner with robotic and LIMS systems. ActiveX Software Developer’s Toolkit is included for integration of the scanner with robotic and LIMS systems. The SampleScan Plus connects to your computer via an included USB cable. No software is required to activate the scanner as the device acts as keyboard input and places the scanned barcode into any open application. Any application that accepts keyboard input, such as Excel or database entry forms will operate with the SampleScan Plus.